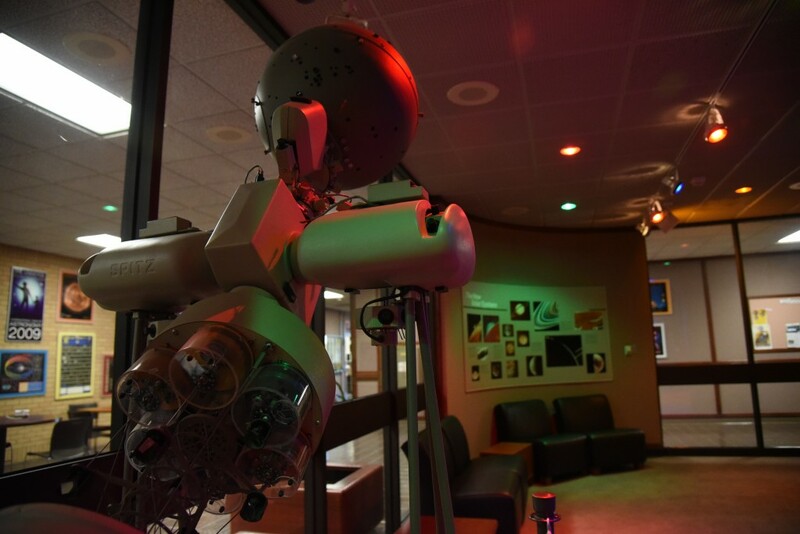 The planetarium lobby is filled with information about the known universe and with some intricate equipment. The ASU Planetarium will premiere two astronomy shows from Jan. 25 through March 8. "Seeing: A Photon’s Journey Across Space, Time and Mind," narrated by astrophysicist Neil DeGrasse Tyson, and "Lewis & Clark: Great Journey West," narrated by actor Jeff Bridges, will be shown at 7 p.m. and 8 p.m., respectively, every Thursday through March 8 at the ASU Planetarium which is located inside of the Vincent Nursing-Physical Science Building. "Seeing" follows the creation of light from inside of a star and the journey it takes to make it into the human eye, where it is eventually turned into a signal that can be used by the brain, while "Lewis & Clark" takes the audience through the events of the explorers’ trip to the west coast of the U.S., according to Associate Professor and Director of ASU Planetarium Dr. Kenneth Carrell. "I showed ‘Lewis & Clark’ in the fall of 2016, and people have asked this year if I was going to show it again," Carrell said. "I think it is a great story about perseverance and, in particular, a great story about an amazing woman. I was told about ‘Seeing’ recently, so I watched a flat-screen YouTube version and was impressed. It is a little different than many of our other astronomy shows, and it is the first time it has been presented in the planetarium." Jennifer Sauceda, junior and ASU Planetarium assistant, is excited to share these shows. "The shows have amazing cinematography and information for the public," Sauceda said. "Students should come and see these shows because they are very educational and, quite frankly, the best shows you see on campus. I absolutely love the planetarium. It’s my favorite place on campus. The assistants and director work very hard to maintain the planetarium, and they do very well at this job." Shows run throughout the fall and spring semesters and change about halfway through, Carrell said. Following March 8, the ASU Planetarium will prepare two different shows for the public. "If you’ve never been to the planetarium to see a show, you definitely should," said Carrell. "It’s a very unique and remarkable environment. The audio and visual capabilities are great, and you learn a little bit while you are there." Tickets are $3 for adults; $2 for children, senior citizens and active military; and free for all ASU students, faculty, and staff.